Semi Ryu specializes in 3D animation and virtual puppetry based on Korean ritual and oral storytelling. Her artworks and papers have been internationally presented in screenings, exhibitions, performances, and publications in 20 countries, including the Chelsea Art Museum, and the book The Point of Being (Cambridge Scholars, UK). 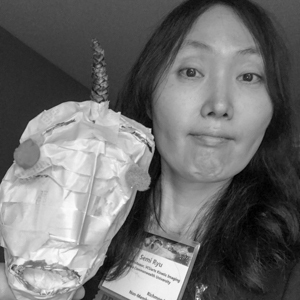 Since 2014, she has been working on the project VoicingElder: Avatar Life-Review for Older Adults to support memory and intergenerational relationships of older adults. Her next project is VoicingHan: Avatar Life-Review Empowering Selves, to support the creation of personalized narratives for individuals with trauma-related memories. Semi is an associate professor in the Department of Kinetic Imaging at Virginia Commonwealth University. A South Korean native, she earned a BFA from the Korean National University of Arts, and an MFA from Carnegie Mellon University. In her talk, Semi discusses the use of virtual reality as a tool for expression and empathy.